There is unlikely to be a youngster with more footballing pressure on their shoulders than Benjamin Aguero. After all, Benjamin’s grandfather is Diego Maradona. 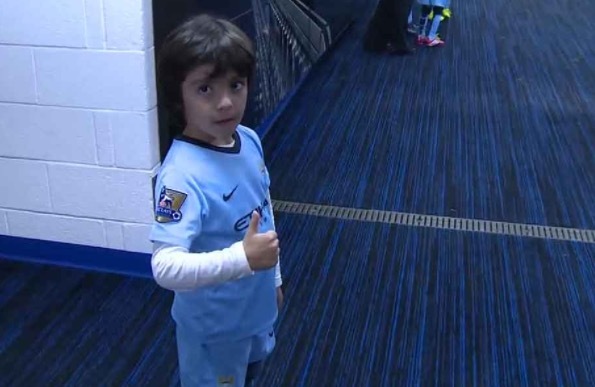 His father is Sergio Aguero. And, his godfather is Leo Messi. On Monday, Benjamin Aguero is the lead story on many of Argentina’s leading football websites. Benjamin Aguero was at Boca Juniors on Sunday, for their 4-1 victory over Colon. The match marked what looks to be Carlos Tevez’s final game for Boca, before he becomes the best paid player on the planet. And, Benjamin Aguero was lucky enough to meet Carlos Tevez and the former Manchester United and Manchester City striker signed his Boca Juniors shirt. After the Boca game, Benjamin’s mother Gianinna Maradona posted on Twitter to say thanks to Carlos Tevez for his gesture. Since Benjamin Aguero was wearing a Boca Juniors shirt and meeting his idol Carlos Tevez. Never mind that Benjamin Aguero is the grandson of a Boca Juniors legend in Diego Maradona. He is the son of Sergio Aguero, who is a committed Independiente fan, the side he played for before leaving Argentina and the one he has confirmed will be his last club. As a result, Gianinna Maradona, the former partner of Sergio Aguero, posted a clarification on Twitter.